Jack Bell Gallery is pleased to present a new series of spray paintings by contemporary artist Aboudia. This will be the artist’s fifth solo exhibition with the gallery. 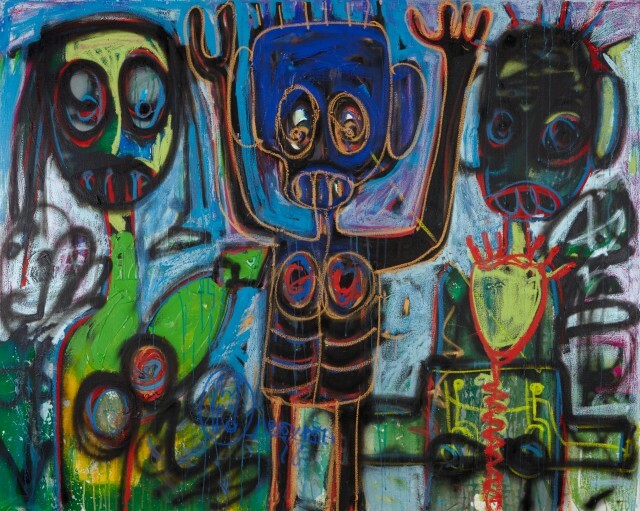 Aboudia is noted for his large-scale, heavily layered, brutally energetic paintings that combine an innocence and spontaneity with the portrayal of a dark interior world. Since the Ivorian civil war in 2011, his urban landscapes have been haunted by trauma; armed soldiers, ominous skulls and a populace hemmed in by violence and danger. This new series continues to grapple with the hardships of life on the streets and the social inequalities of downtown Abidjan. Often claustrophobic and oppressive, his painting achieves a careful balance between pathos and aggression. While the vitality of his style recalls Basquiat, the darker undercurrents and themes describe a battlefield straight out of Goya. Aboudia is also a master of multi-layered imagery as he mixes with great energy characters from his direct neighbourhood, local ‘Nouchi’ street culture and references to more traditional forms of Vodou. Enigmatic details come in and out of focus, often only revealing themselves after several viewings. His expression of revolt and explosive, incendiary life in his everyday urban environment brings to mind artists from the great American tradition, Twombly perhaps in his casual-looking execution, and Dubuffet. Aboudia's unrestrained use of violent figuration is a welcome reminder of the power of paint to suggest the vitality and chaos of life. Aboudia was born in 1983 in Abidjan, Ivory Coast. His work has been exhibited in both ‘Pangaea: New Art From Africa & Latin America’ and ‘Pangaea II’, Saatchi Gallery, London, and ‘In all Cases’ at the Nevada Museum, USA. Paintings have been acquired by major collections worldwide, including the CAAC Pigozzi Collection, Switzerland, the Frank Cohen Collection, UK, Saatchi Gallery, UK, and the Museum of Modern Art, Equatorial Guinea.